Its half term this week, a great time to review the beginning of the teaching year and to catch up with one of my students. Meet Caroline. Julie and I first met at a networking event in Faversham. I remember thinking “I must talk to Julie and make sure I get her business card”, as I have always enjoyed ‘trying’ to arrange flowers. 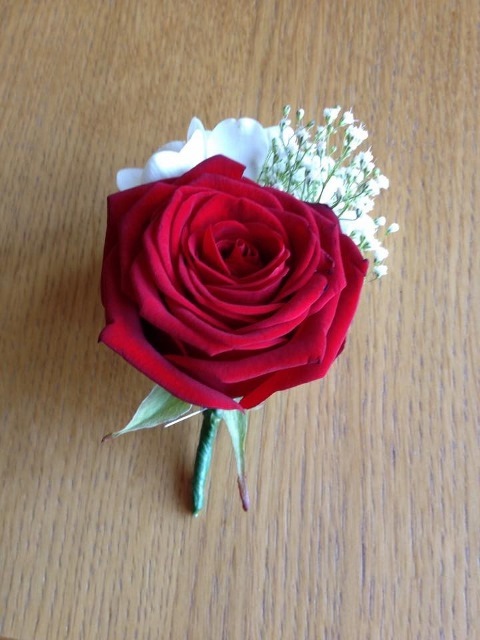 I subsequently attended Julie’s classes at Kent Adult Education in Canterbury where I had a go at a buttonhole, bouquet and table arrangement. I then signed up for Julie’s workshops at the Freewheel in Graveney but, unfortunately, I managed to fracture my wrist and was unable to attend. 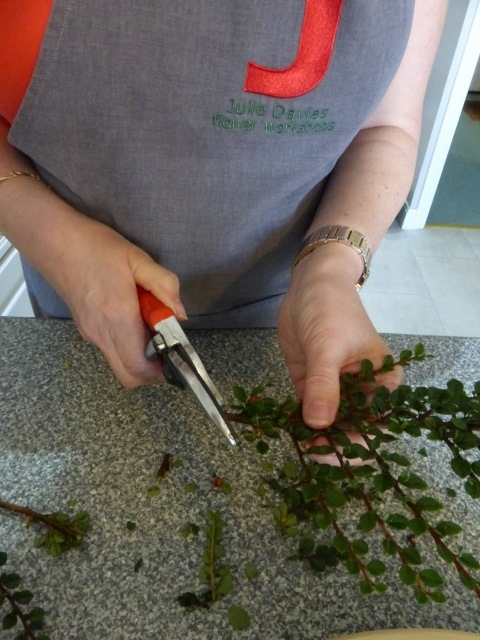 However, Julie kindly agreed to come to my house to do all three workshops in one session once I was out of plaster and able to wield a pair of scissors to cut flowers. I was born in Whitstable and have always worked in Canterbury, Whitstable or Faversham – so I am very much a local girl. I had always wanted to be a vet but wasn’t quite academic enough and was far too emotional about animals. I passed the RSA Stage I typing exam whilst still at school, so I went on to complete a two-year secretarial course – it seemed I had found my forte! I met and married my husband, Robin, fairly late in life so I don’t have children of my own; however, I have two wonderful stepchildren – Glyn and Abigail. I have some amazing friends; some I have known for many years, others are more recent acquaintances made through business networking. I like nothing better than getting together for a chat over a glass of wine or afternoon tea. I love a garden but am not particularly ‘green fingered’. We have only a small ‘courtyard-style’ garden, which is mostly decking with a bit of raised border. Flower arranging is more my thing. I think my interest stemmed from winning a competition at school, although I confess to having received some instruction and practice from a neighbour the day before! 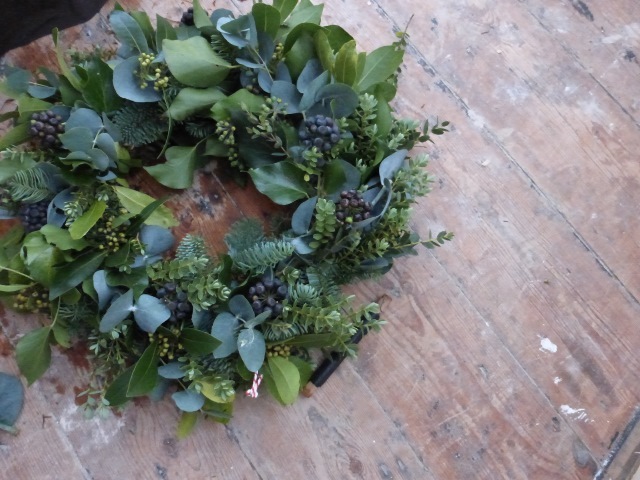 I have attended three Christmas flower workshops in recent years. They were great fun and I came home with some amazing arrangements – a door wreath and an advent candle which I didn’t dream I could ever create! After being made redundant three times – the third time from a job I loved – in 2010 I decided to become my own boss. I now provide cost effective, flexible and efficient PA/secretarial and admin services to a variety of clients, mostly sole traders, principally working from my home office in Faversham. Admin is an essential but non fee-earning aspect of any business and many people don’t like it or find they spend far too much time on it. Outsourcing is a great way to free up their valuable time to enable them to concentrate on developing their business and generate income. Why spend time on something you don’t enjoy/are not good at when an expert can do it in a fraction of the time? 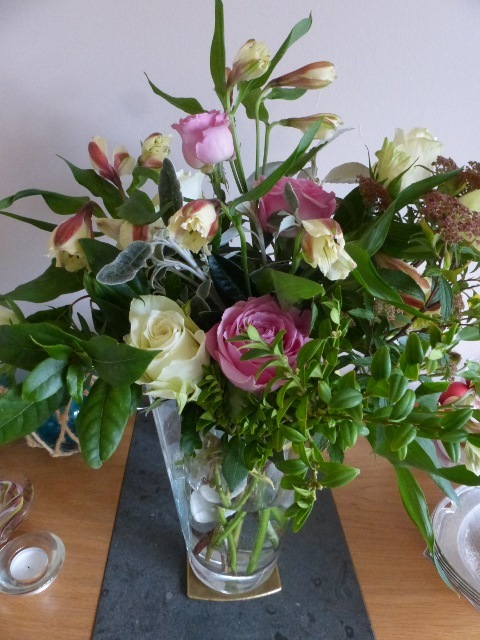 I shall, of course, be looking forward to creating a Christmas flower arrangement. However, my stepson and his fiancée are getting married next September and I am looking forward to helping them with their flowers. 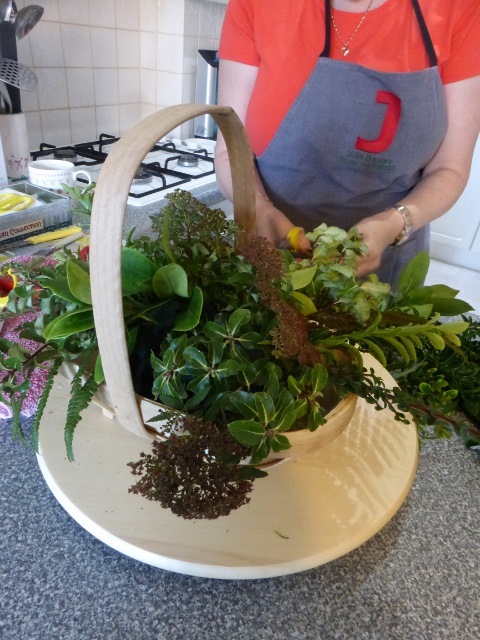 Julie’s classes have given me a good starting point and I am sure that with a lot of practice between now and then I will be able to create something special for their big day! A note from me: it’s been lovely having you at class Caroline. I’m looking forward to hearing about next year’s wedding flowers! 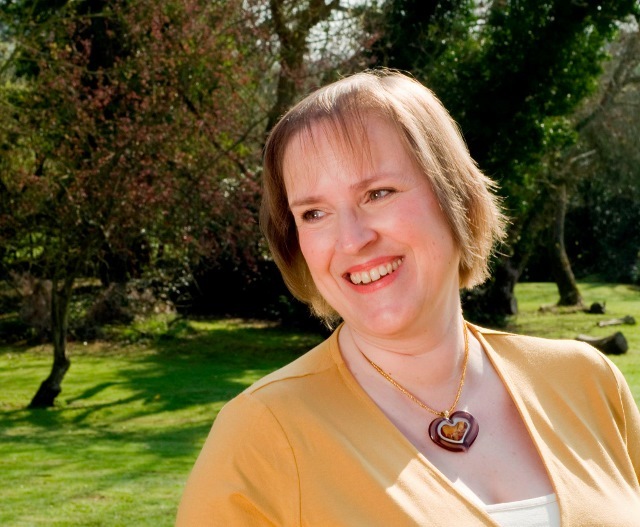 You can find out more about Caroline’s services as a VA/Virtual Assistant via her website. If Caroline’s story has inspired you why not sign up for my newsletter and I’ll keep you informed about my classes.